The information contained within this section may be subject to change without prior notice, and whilst every attempt is made to keep the Date News & Events Section up to date, events may change at any time. Please confirm with the relevant event organiser before traveling. 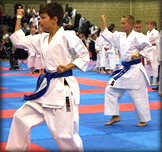 Please also note that entry forms available on this page are for information only, all entries must be made through your club instructors, or a Wado-UK official. Please do not submit entry forms yourself, Thank You!